Bahraini regime forces have attacked anti-government protesters ahead of the general elections in the Persian Gulf Arab state. The fresh clashes erupted on Friday as thousands of people took to the streets of the northern village of Diraz to protest against the government. The protesters said the elections, scheduled to be held on Saturday, are doomed to fail. In a symbolic gesture, they also cast ballots in a referendum against the Manama regime. 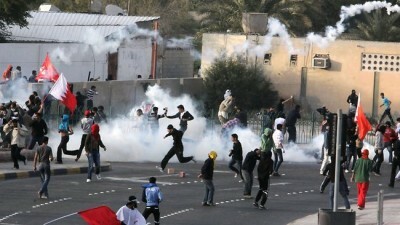 Security forces fired tear gas to disperse the demonstrators. Bahrain’s main opposition group al-Wefaq and four other Sunni and Shia groups have boycotted the legislative and municipal polls. The opposition says it wants a real constitution with an elected, independent government. Salman warned that failure of the regime to implement reforms in line with a strict timetable could spark an “explosion” of violence in Bahrain, which is home to the US Navy’s Fifth Fleet. The government, meanwhile, says it is open for dialog with the opposition. Previous negotiations between the two sides have, however, failed to produce any results. Since mid-February 2011, thousands of protesters have held numerous demonstrations in the streets of Bahrain, calling for the Al Khalifa royal family to relinquish power. According to local sources, scores of people have been killed and hundreds arrested in the regime crackdown.